iOS 4.3, Personal Hotspot, and iPad 2 Introduction Within Next Ten Days? A series of reports and rumors are suggesting that Apple is preparing to release iOS 4.3 and its personal hotspot functionality to the public, possibly by February 13th. At the same time, Apple may be taking the opportunity to also offer a preview of the second-generation iPad ahead of a potential early April release. In his review of the Verizon iPhone, Daring Fireball's John Gruber lays out his argument that iOS 4.3 will appear within the next two weeks to provide support for in-app subscription payments for The Daily before the free two-week trial runs out. The Daily requires a subscription - either $1 per week, or $40 per year. They're using a new in-app subscription payment system from Apple for this - but these in-app subscription APIs aren't in iOS 4.2. So The Daily launched today, free for a limited time. They announced at the event that this initial free two-week period was brought to us by: Verizon. Gruber surmises that Apple and Verizon worked out a deal in which Verizon gets a very brief exclusivity period (perhaps in publicity only, given that the Verizon iPhone doesn't launch until February 10th) for the personal hotspot feature while also agreeing to sponsor the free two-week access for The Daily to carry users through until Apple announces and releases iOS 4.3 with in-app subscription and personal hotspot support for existing iPhones. 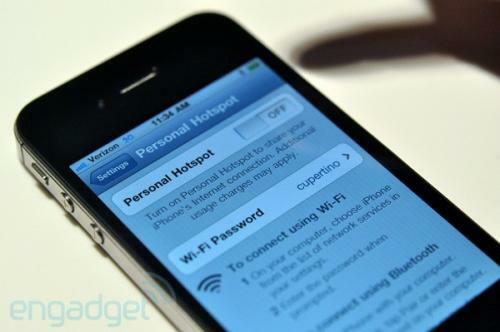 The single new feature in Verizon's iPhone is Personal Hotspot, where the iPhone becomes a Wi-Fi base station. Up to five laptops, iPod Touches or other gadgets can get online, using the phone as a glorified Internet antenna. That's incredibly convenient. Many other app phones have it - AT&T's iPhone gets it on Feb. 13 - but Apple's execution is especially nice. The review has since been edited to replace the mention of February 13th with "AT&T says its iPhone will get it soon". Finally, MacNotes.de reports that it has heard that Apple is planning an event for next week where the second-generation iPad will be shown off. The report speculates that Apple will announce a special iOS 4.3 media event to introduce in-app subscriptions, an announcement Apple vice president Eddy Cue revealed would be coming soon during yesterday's introduction of The Daily. A preview of the second-generation iPad could come as a "one more thing" surprise at the end of that media event. MacNotes.de had previously reported that Apple is shooting for an iPad release in the United States on the first or second Saturday in April.